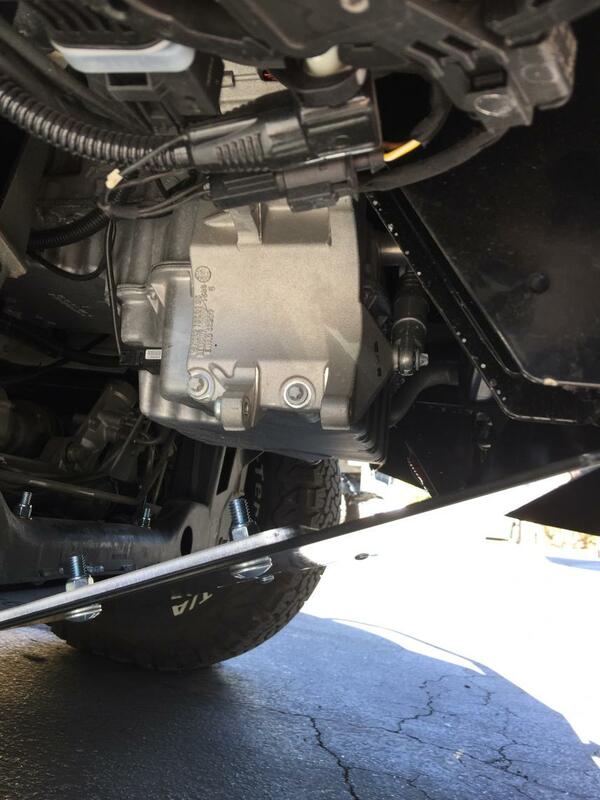 Mercedes did not add any protection to the engine oil pan, transmission oil pan, transfer case or plastic fuel tank on the 4x4 Sprinter. A 4x4 van should have protection in these areas if you plan to venture off road. The cast aluminum engine oil pan can easily shatter if it makes contact with the ground and I would hate to puncture the fuel tank cresting over a steep hill on the trail. Van Compass has fitted and installed our skid plate systems on numerous Sportsmobile 4x4 Sprinters. The skids are compatible with the Aluminess front hitch and bumper. Fuel Tank Skid product link. Sweet! Added to my upgrade list. They will be installed on my Sprinter when I bring it back from Austin in a month or so - come to the Valley of Fire Meet Up to see them! I just returned from Austin with a stop at Van Compass along the way. Do yourself a favor, lay down under your Sprinter and look, then you will see the wisdom in installing the package. I know I'm glad I did. And FYI, there are no conflicts with this and the Aluminess front winch bumper. One thing not mentioned above is the added protection if you install the 2nd alternator. It is low, maybe 17" above ground on the 4x4, and it is exposed. In snow country I would see the engine skid plate as required, both for 2wd and 4wd. Mark and Rob told me of one customer who came in for the protection AFTER snow packed in and killed the alternator. My van doesn't have the 2nd alternator, but it does have the bracket in case I decide I want it in the future. Here is a picture I took of my van, you can see the bracket where the 2nd alternator would be installed, just above and protected by the engine skid plate. "Factory overrun protection mounts are required for engine skid plate mounting. Please make sure you Sprinter has the mounts pictured below that hang down ~ 6" Additional info pictured in the instructions. If you do not have these mounts please contact us. We will provide a solution. " But I'm not finding anything about the 'factory overrun protection mounts' in the installation instructions for the engine skid plate. Does anybody know what they are talking about? Thanks. See step #2 of the instructions. The overrun mounts hold the crossbar in place. Step #16 also shows where the skid plate will bolt to the mounts. I have attached a picture for reference. Looks like we are taking about this then and I should be all set? I installed the Van Compass front skid plate and am super impressed with the quality and design. It fit perfectly, aligning to all of the factory holes. It looks great and am glad to have it. I am just a happy customer, no affiliation. Some small hands helped me place the spacers and that was a big help as they are in tight spaces. I wish these were available for non-4x4 Sprinters. My second alternator would love a little protection.